In Minnesota, folks walk out of the State Fair, past the plump, prize-winning pumpkins, and smack dab into autumn. Disappointed not to have grown their own gourds, they look to pumpkin patches to supply the décor needed to jack the lanterns, drape the decks and bedeck doorsteps in all the splendor of fall in Minnesota. But, like the pumpkins themselves, not all patches are the same. The 10 best patches have much more to offer than just pumpkins. Perhaps the premier pumpkin patch on the east side of the Twin Cities, Country Sun Farm is much more than a place to wait for the Great Pumpkin's arrival. Along with hayrides on weekends, visitors enjoy concessions, a petting zoo, a corn maze and other fun, fall, family activities. Folks searching for a fall fix in the Rochester area need look no further than Sekapp Orchard. Featuring corn and straw-bale mazes, as well as hayrides, families can do much more than gather future jack-o-lanterns at the orchard's Pumpkinland. Is there a better place to find the perfect pumpkin than Anoka, the self-proclaimed 'Halloween Capital of the World?' Berry Hill Farm boasts a basketful of Halloween fun for the whole family. Take advantage of tractor tours, a tall-grass maze or Tommy's Zoo, before grabbing a red Radio Flyer wagon and heading out to the field to pick your perfect pumpkin. The best pumpkin patch in the Duluth area is just up hill at Engwalls Hermantown location. Yes, you can pick out a pumpkin at Engwalls, but don't stop there! Engwalls boasts a big corn maze with several seasonal events, from flashlight tours to a haunted maze. With a bluff-top location and views of the St. Croix River valley, Afton Apple Orchard is definitely one of the prettiest pumpkin patches you'll find in Minnesota. Take a scenic hayride and pick your own pumpkin while enjoying a steaming cup of the orchard's own apple cider. For families in the Fargo-Moorhead area, Buffalo River Pumpkin Patch is the place to go for a dose of Halloween spirit. With everything from a game area to duck races and horse-drawn hayrides, the whole family will find something to make them happy. Oh… They also have pumpkins. When it comes to "more than just a pumpkin patch," you can't get much fancier than Emma Krumbee's. Located between Shakopee and Mankato, this orchard has it all when it comes to fall festivities, starting with a restaurant and scarecrow display. Then you can take a hayride, wander the tombstone forest, or ponder the Goat Habitrail before choosing pumpkins and heading home to carve them. Only 10 minutes outside of St. 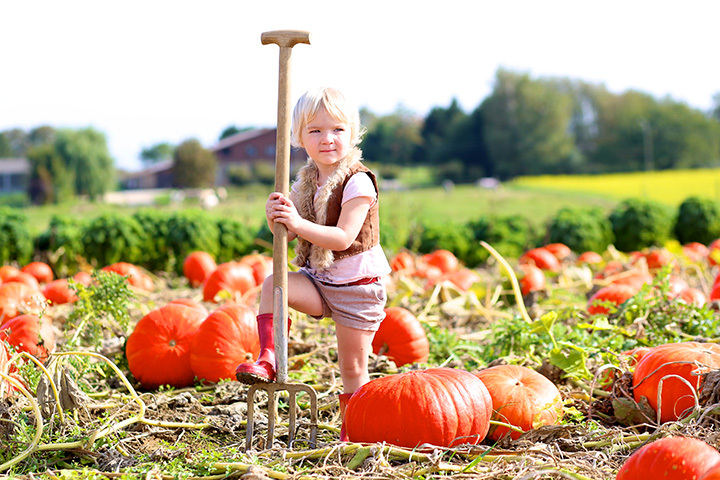 Cloud, Grandpa's Pumpkin patch offers a plethora of pumpkins for your carving pleasure. Within an estimated inventory of more than 1,000, you're certain to find the perfect pumpkin to carve this season. Feel free to feed the friendly chickens that roam the patch's paths. For pumpkin-searching folks in the Mille Lacs area, Gilby's Nursery and Orchard is a good bet. The orchard offers family fun like hayrides, walking trails and a haunted corn maze, along with more than two miles of pumpkins in their patch. Enthusiasts are invited to come choose their pumpkins in August and inscribe their names or designs on their pumpkins while they're still on the vines. After a few more weeks of growth, the décor becomes a permanent part of the pumpkin. People looking for a sustainable take on pumpkin farming should check out the Farm on St. Mathias near Brainerd. In addition to sustainability, and responsible farming practices, the farm boasts two corn mazes and a country store that opens during pumpkin season.